Find a Great Summer Camp! 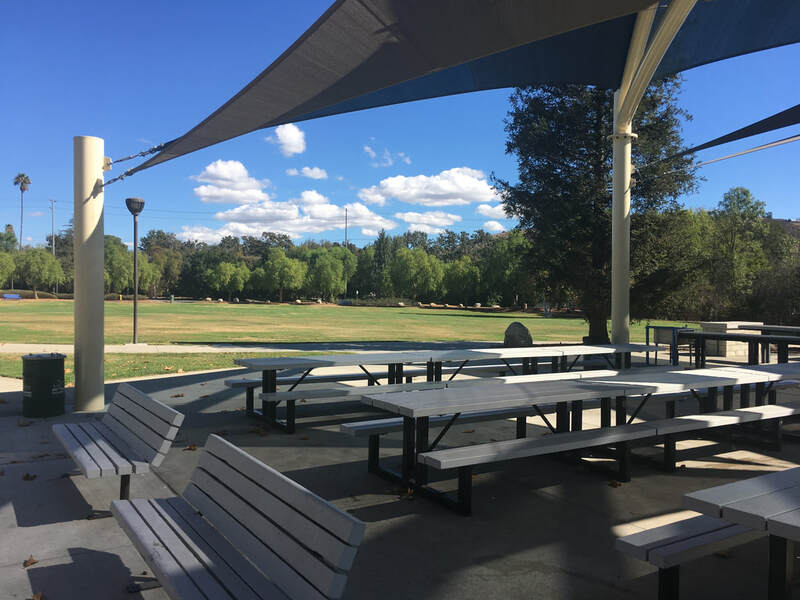 This is the time of year Conejo Valley parents start looking for that perfect summer camp for their kids while the kids get excited for camp. The Conejo Valley is loaded with all sorts of fun and exciting summer camps and programs for kids. From day camp at the beach to more traditional programs with horseback and archery activities, Conejo Valley families have no shortage of amazing summer camps to choose from. Even though the wide variety of available programs is an exciting prospect to ponder, it can also be a somewhat difficult task knowing where to turn when you're ready to take the first step in the camp selection process. We've made it easy for you to find the best summer program with a "one-stop-shop" of over 50 summer camps all in one place! Don't miss the Conejo Valley Camp Fair on Saturday, April 14 at Conejo Creek North Park in Thousand Oaks. There will be dozens of camps exhibiting their programs, so you'll easily find a great Conejo Valley summer camp. You'll be sure to find an amazing for a Conejo Valley Summer Camp at the April 14 Camp Fair. Representatives from over 50 day camps, overnight camps, specialty camps and so many other amazing programs will be on hand ready to meet you, answer all your questions, hand out free brochures, videos and promotional items, and share and discuss the programs and activities they offer this summer. Are the Camps at the Camp Fair Only Conejo Valley Programs? Nope! This camp fair isn't limited to just to Conejo Valley programs alone. Far from it! there will be a wide range of camps and programs from all over the country exhibiting at the Conejo Valley Camp Fair. Regarding locally based programs, the Conejo Valley Camp Fair will be LOADED with camps from Thousand Oaks, Agoura, Westlake Village, Camarillo, and many other Conejo Valley areas. So if you're in the market for a local program, you'll find it here. But if you're looking for a summer camp or program outside the Conejo Valley -- for example, if you're one of the many families who might be interested in finding an overnight summer camp a little further away -- you won't want to miss the camp fair because there will a number of fantastic programs to consider from all over California and even other parts of the country like SeaWorld Overnight Camp in San Diego, a sleepaway camp located on California's central coast and many others . What are Some of the Best Conejo Valley Summer Camps? We feel the "best camp" is a subjective concept, meaning what's best for you might not be best for another family. We suggest coming to the Conejo Valley Camp fair to meet and greet all the various camp representatives to learn about their programs. You'll be amazed at the wide variety of program opportunities for your child. Attending the Camp Fair is the perfect way to find the best camp for you because you'll be able to gather information from all the camps that interest you the most, then you can narrow down your choices after the camp fair ends to find the best camp for you. How Much Does the Camp Fair Cost? Absolutely nothing! It's entirely free, and parking's free, too. But even though the Camp Fair's free, we're expecting a large crowd and want to give all the participating camps a "heads-up" so they bring enough free brochures and prizes to hand out to all the families attending the fair. So we're requiring everyone who wants to attend to grab a free ticket. This way we'll know in advance how much food to bring, prizes to give out, and generally plan better for an outstanding event. Get your free tickets here. The Conejo Valley Camp Fair is easy to find! 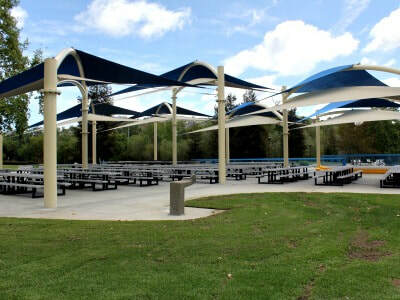 We're located inside Conejo Creek North Park in Thousand Oaks at the Lakeside Pavillion. As you enter the park, just follow the access road all the way around until you come to the Lakeside Pavillion. You'll see a big grass field, a big blue pavillion and lots of people outside. Can't miss it! What is the Date of The Conejo Valley Camp Fair? The Camp Fair takes place Saturday, April 14, 2018. It begins at 12:00 PM and ends at 3:00 PM. Activities and the opportunity to meet camp directors and learn about their programs will be ongoing the entire time, so feel free to show up at the Camp Fair any time between noon and 3:00 PM. You'll Find a Great Camp, and a Whole Lot More! One last thing we thought you should know. 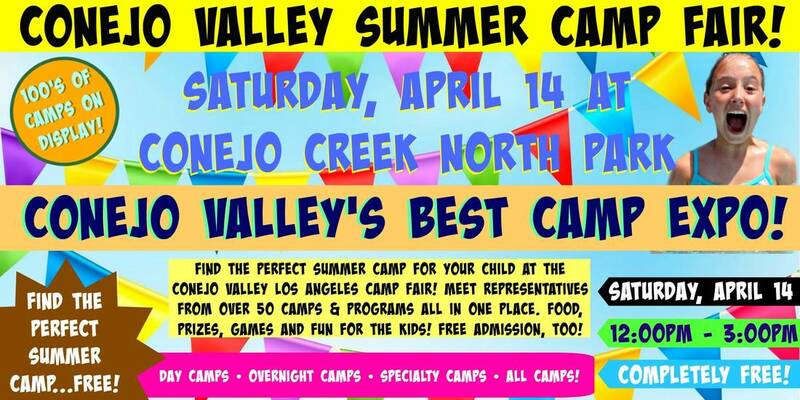 Even though learning about Conejo Valley summer camps and programs is the primary focus of the camp fair, there's a lot more that that going on at this event! You'll be able to play games, win prizes like free camp sessions from participating programs, and get free goodies and gear from all the camps. One of the participating programs is even setting up an obstacle course for the kids to run though, and a surf camp is giving free surfing lessons on the sand. We'll also have a BBQ cookout, so come hungry!